Today Ulf took care of Felix to leave me a couple of hours to do some origami. Ioana Stoian had given me two sheets of some wonderful Kozo paper, which she had manufactured in Japan - from chopping down the trees all the way to producing the final sheet of paper. It was clear to me I had to fold something special from it. It also screamed tessellation, because I wanted to preserve the deckle edge. 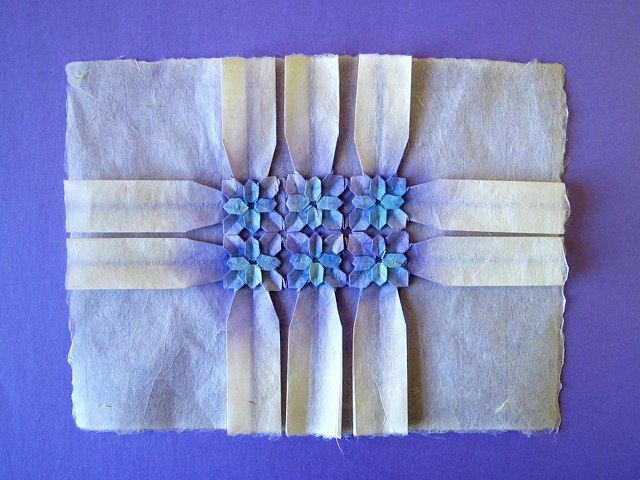 I thought about which model to fold from this paper for a while, and ended up with a tiled version of Shuzo Fujimoto's Hydrangea.